Home » Food and Nutrition » The Top 4 Common Health Myths Exposed! When it comes to health, it seems like everyone is a guru. There are so many beliefs and opinions that it can be very hard to separate fact from fiction and know what to believe. The media doesn’t help either. One day, for example, they’ll report the benefits of coffee; two days later, they’ll tell you how dangerous it is! 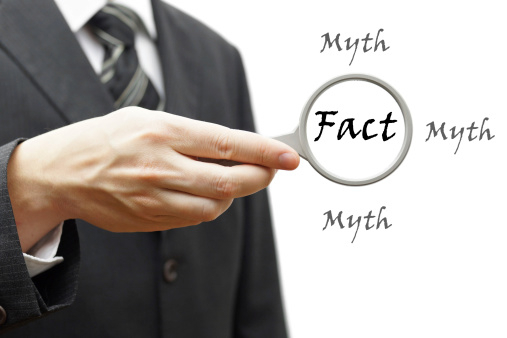 When it comes to breaking down the truth to common health myths, we do our research. There are so many things that are generally held to be true, or proposed as fact in the media, that you might be shocked to learn that they often come with little to no basis once you dig a little deeper. Today, I’d like to share our findings of four of the most common health myths we’ve been hearing lately—just to set the record straight for you. It seems like humans instinctually gravitate toward the word “natural.” It makes it seem like it’s from the earth, so it must be good! But “natural” is not synonymous with “healthy.” If you’re out in the woods, for example, and see some berries growing on a bush, they may be natural, but they might be poisonous to eat. The same goes for various mushrooms and other plants. Alternatively, prepackaged foods containing lots of sugar and calories may be full of natural ingredients, but that cookie is still a cookie. Nature can be your friend just as much as it can be your enemy. Be sure to inspect your food beyond its “natural” label. The toxicity of sugar is well documented. It’s a fact that sugar leads to metabolic problems, obesity, high cholesterol, and type 2 diabetes. At present, there is no such data—or at least no consensus—on zero-calorie artificial sweeteners. Some observational studies show an association between them and weight gain, for example, but it could be because they are used to enhance a poor diet, like eating a bag of chips while drinking a can of Diet Coke. But the claims of zero-calorie sweeteners causing cancer and other health problems are unsubstantiated. If you’re looking for ways to cut sugar and add sweetness, artificial sweeteners likely won’t cause any harm. This is also untrue, and should come as a relief to anyone who’s stretching their budget to buy expensive organic fruits and vegetables. Numerous reviews have found there is no nutritional benefit to eating organic—you’re going to get the same benefits from organic spinach as you would from non-organic spinach. If it’s the pesticides that concern you, be sure to wash your fruits and vegetables well before consumption, rinsing them under water for at least 30 seconds. Again, this is largely a myth. You’ll lose some nutritional value by cooking your vegetables, including vitamin C, but you’ll enhance others, like certain vitamins and antioxidants. Plus, because vitamin C is largely available in a variety of sources, the loss in cooked vegetables is not necessarily a concern. What might be even more of a surprise is that microwaving might be the best way to cook veggies because it exposes them to heat for the least amount of time. Although eating raw vegetables is not bad for you and still allows you to enjoy the nutrition of vegetables, they are not very palatable. At the end of the day, eating more fruits and vegetables is what matters—not whether or not they’ve been cooked. There are a number of health myths that exist. The more you know, the better off you are. Get informed to get healthy. Smith-Spangler, C., et al, “Are Organic Foods Safer or Healthier Than Conventional Alternatives?” Annals of Internal Medicine web site, September 4, 2012; http://annals.org/article.aspx?articleid=1355685, last accessed October 16, 2015. Carroll, A., “The Evidence Supports Artificial Sweeteners Over Sugar,” New York Times web site, July 27, 2015; http://www.nytimes.com/2015/07/28/upshot/the-evidence-supports-artificial-sweeteners-over-sugar.html?_r=0, last accessed October 16, 2015. Beck, L., “What is the best way to cook vegetables to maximize their nutritional value?” Globe and Mail web site, April 13, 2015; http://www.theglobeandmail.com/life/health-and-fitness/health/leslie-beck-how-to-keep-the-vitamins-in-your-veggies/article23900957/, last accessed October 16, 2015.